Our product range includes a wide range of asbah tea tree treatment oil and advance skin care system-damage recovery system. Usage/Application Apply few drops & massage the oil into your skin day and night. 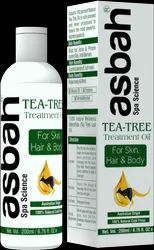 Asbah's 100 percent Natural Tea Tree Oil is cold-pressed and never processed to ensure the most powerful, highest-grade oil. Best for Acne & Pimple prone Skin, Anti Blemish. 100% Natural Melaleuca Alternifolia (Tea Tree) Leaf Oil. Dry Hair : Part the hair into sections, apply one to two drops to each partition, and massage into the scalp. Fop Best Result applied before bedtime & leave it overnight. For Face: Apply few drops & massage the oil into your skin day and night. •DR 2 SYSTEM Ceramide, Sodium Hyaluronate Cross Polymer, Rhodosorus Marinus Extract, Lactokine Fluid PF, Rose Water, Arnica Oil, Fennel Fruit Extract, Base Q.S. •1. Treeology’s DR System contains proteins and peptides originating from cow‘s milk and strengthening the skin’s immune system. It enables the skin cells to deal with the inflammatory processes in skin more effectively. •2. The innovative system works on the damaged area in two stages by reducing the inflammatory response through calming, foaming protecting layer, hydrating and protecting the skin in the short- and long-term. •3. It also includes protection against UVA and UVB.